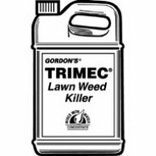 Formulated to provide broad spectrum broadleaf weed control the PBI Gordon Corp Trimec Weed Killer kills hard-to-control lawn weeds including over 250 broadleaf weeds. Ideal for use on Kentucky bluegrass, Bermuda grass, perennial ryes, fescues and more. Specially designed for use on cool-season grasses. Available in a gallon size with one gallon covering approximately 32,000 to 64,000 square feet (northern vs. southern lawns). If you have any questions about this product by PBI / Gordon, contact us by completing and submitting the form below. If you are looking for a specif part number, please include it with your message.